NEWPORT BEACH — As the Port of Long Beach’s June 30 deadline approached, the dredging team on Newport Harbor’s Lower Bay Project worked at full speed to transport as much contaminated sediment as possible from the harbor to the approved disposal site at Long Beach’s Middle Harbor Project. The sediment, approved for use in the port project, cannot be disposed of in the ocean. By the deadline, about 85,000 of the 120,000 cubic yards of material planned for removal had been barged to Long Beach. However, port officials asked the city to postpone delivering the remainder of the sediment. Throughout the process, Miller has been in contact with dredging company R.E. Staite Engineering and Port of Long Beach officials, negotiating how to get all of the sediment to the port’s approved landfill site before the window of opportunity closes. At completion, Newport’s $8.5 million Lower Bay dredging plan will remove around 500,000 cubic yards of sediment. About 120,000 cubic yards of the total sediment was tested and determined to be unsuitable for ocean disposal, and must be dumped at the Port of Long Beach’s Confined Aquatic Disposal site. In an effort to speed up the process, Miller moved to a 24-hour dredging schedule, allowing the dredging barges and scows to “chase the tides,” and fill to their maximum potential at the highest tides — day or night — without worry of running aground in the harbor’s shallower areas. In addition, the city contracted a barge being used in the Marina del Rey channel entrance dredging project for a few days to accelerate removal. Marina del Rey’s dredge scow Paula Lee was down for a period of time in need of repair, and Miller said R.E. Staite was able to rent a disposal scow from Dutra Dredging Co., which allowed R.E. Staite to more than double its dredging capacity for a week. 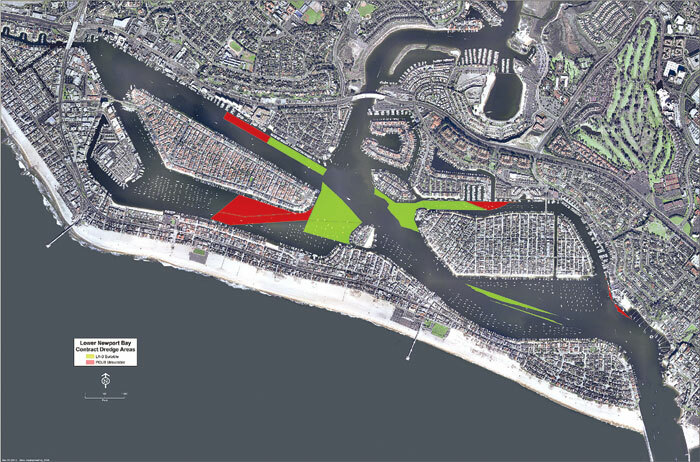 The project has four areas of contaminated sediment marked for disposal at Long Beach: the water area in front of the Balboa Bay Club; along Via Lido Soud, stretching across the channel to Balboa Peninsula; in front of Balboa Yacht Basin; and in front of the Harbor Patrol and Coast Guard dock area. So far, dredging in the Balboa Yacht Club section and the area between Via Lido Soud and Balboa Peninsula has been completed, with the two smaller areas now waiting for the Port of Long Beach to reopen its site. Until then, Miller said the dredge team will focus on the clean sediment areas. The next segment of the project to be funded is expected to go before Newport Beach City Council for final approval at either its July 10 or July 24 meeting. If approved, the remainder of Newport Harbor Yacht Club’s mooring field will be dredged, along with the adjacent “F” Mooring Field. Throughout the dredging process, boaters with vessels in mooring fields marked for dredging have been coordinating with South Mooring Co. and Orange County Sherriff’s Harbor Patrol on when and where to move their vessels.